Diabetes mellitus is a major source of morbidity in the United States, affecting between 10 and 15 million people (1). The cause of much of this morbidity and mortality is vascular disease, including both atherosclerosis and microangiopathy (2–4). 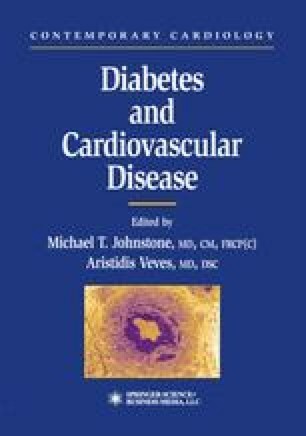 As discussed elsewhere in this text, atherosclerosis occurs earlier in diabetics than nondiabetics, its severity is often greater, and its distribution is more diffuse (5,6). Vascular disease in diabetics also affects not only large vessels but microvasculature as well, resulting in both diabetic retinopathy and nephropathy (7,8).